Welcome to the July Garden Blogger Bloom Day at Clay and Limestone. It's hot and humid and while many flowers thrive in these conditions, it's a challenge for others. I am hoping the Phloxes will last a bit longer, but, if they fade away we will have the Rudbeckias to celebrate later this month. 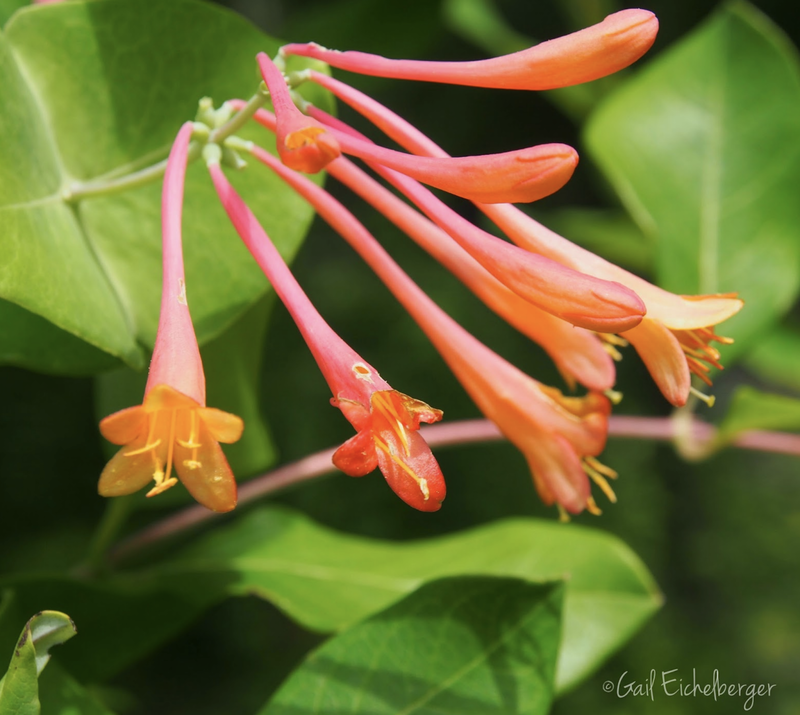 Without further chatter, here are some of the blooming natives in the garden. Liatris spicata the dense blazing star or prairie gay feather, the blossoms begin opening from the top of the spike downward. Bees and butterfly love it. I plan to add even more, especially the fall blooming Liatris that are also native to middle Tennessee. 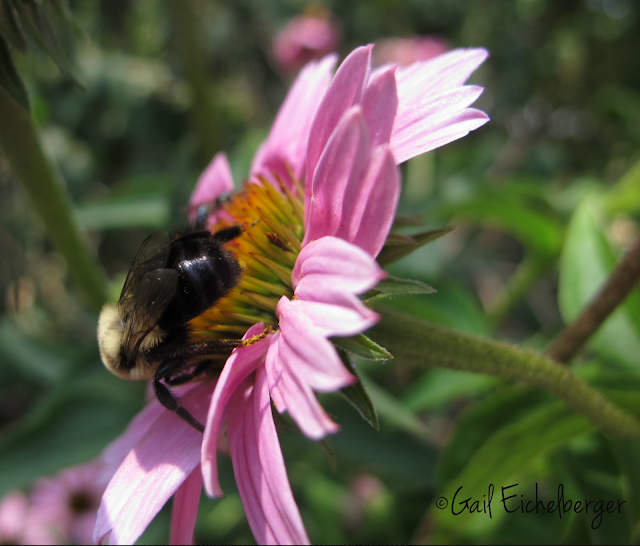 Echinacea purpurea 'Ruby Star' with a bee friend. I love purple Coneflowers and wish I could get a huge stand of them...There's not enough sun and winter drainage is a problem, but, I do keep planting them. Lonicera sempervirens 'Major Wheeler' has been blooming since early April...The hummers stop by everyday, but first they visit the Monarda! Bee balm/Monarda didyma 'Jacob Cline' ...I wish I had a hummer to show you here, but they visit when I am working in the garden and not when I am photographing it! 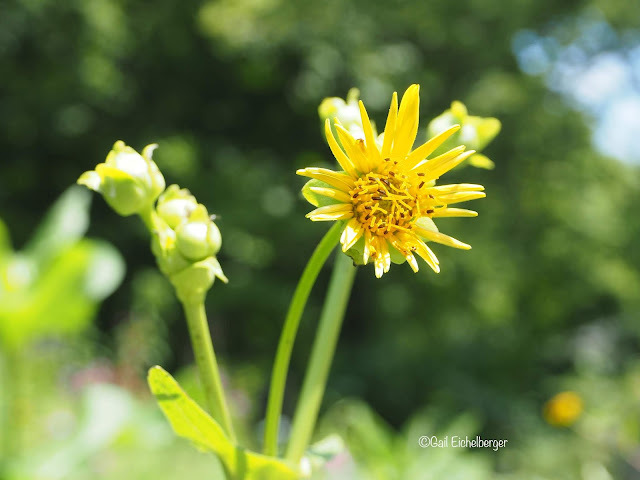 Cup plant/Silphium perfoliatum is one tall wildflower! This just opened and there were no bees visiting the morning I took this photo! This is a great plant for naturalizing; for a screen or the back of the border. 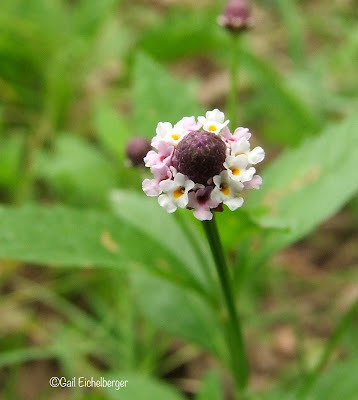 Phyla lanceolata/Lanceleaf fogfruit, a cutie pie relative of Verbena was the June Wildflower Wednesday star and is still blooming. 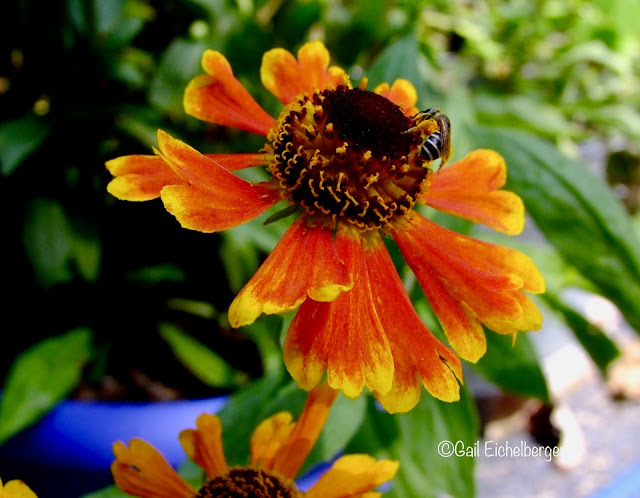 Helenium ‘Marti Gras’ — Yellow flowers aging to orange, rich chocolate brown centers, 3 – 4’ tall. Keep the soil moist and spent flowers deadheaded for long bloom. I love Sneezeweed, unfortunately some of the best cultivars never make it to the Nashville nurseries. Phlox paniculata 'Jeana'. 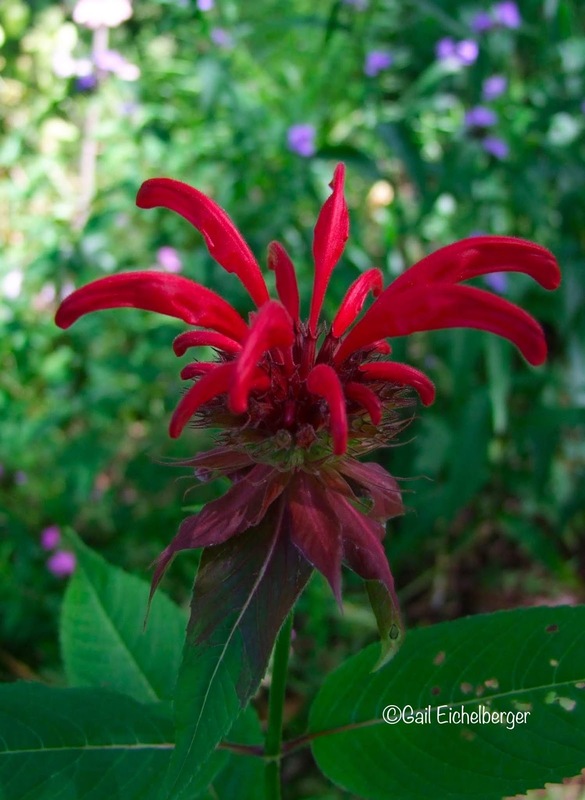 This cultivar was discovered growing along the Harpeth River near Nashville, Tennessee and named after its discoverer, Jeana Prewitt. It's a butterfly magnet and does not mildew! 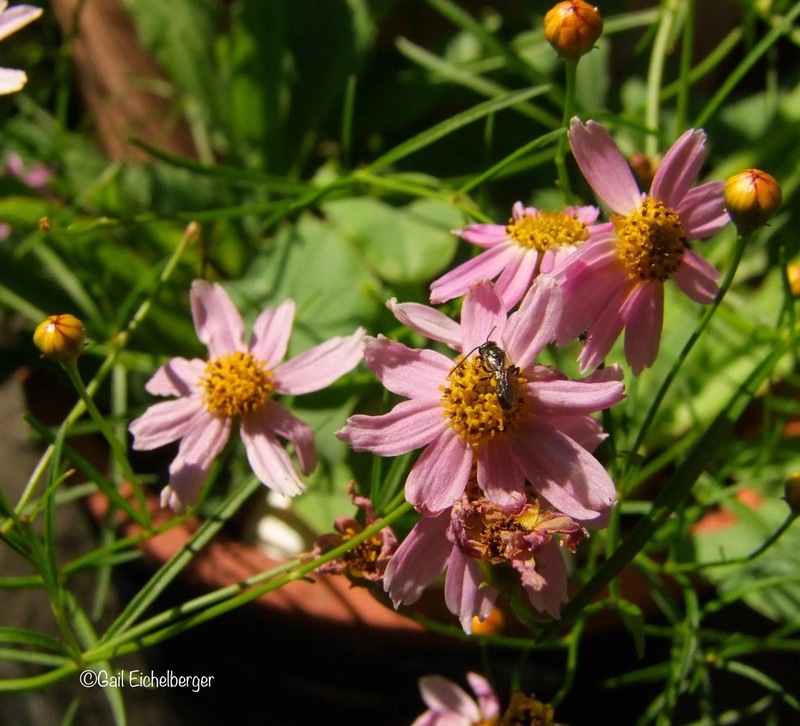 Coreopsis rosea, a sweet flower that will bloom most of the summer if deadheaded or cut back. I find it's easier to keep it happy in a container than planted in my too dry clay summer soil. The little bees love it. Phlox paniculata, let's just call it a seedling of a cultivar! 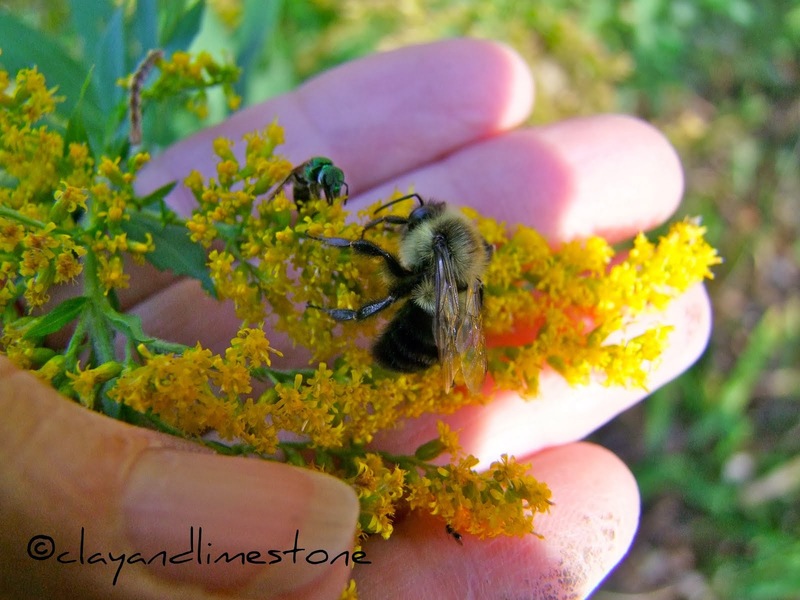 Carpenter bees are notorious nectar robbers. That big body makes it hard to fit into many flowers and they will drill or cut into the corolla of a plant to get at the nectar. Not to worry, there are plenty of other visitors to pollinate them. 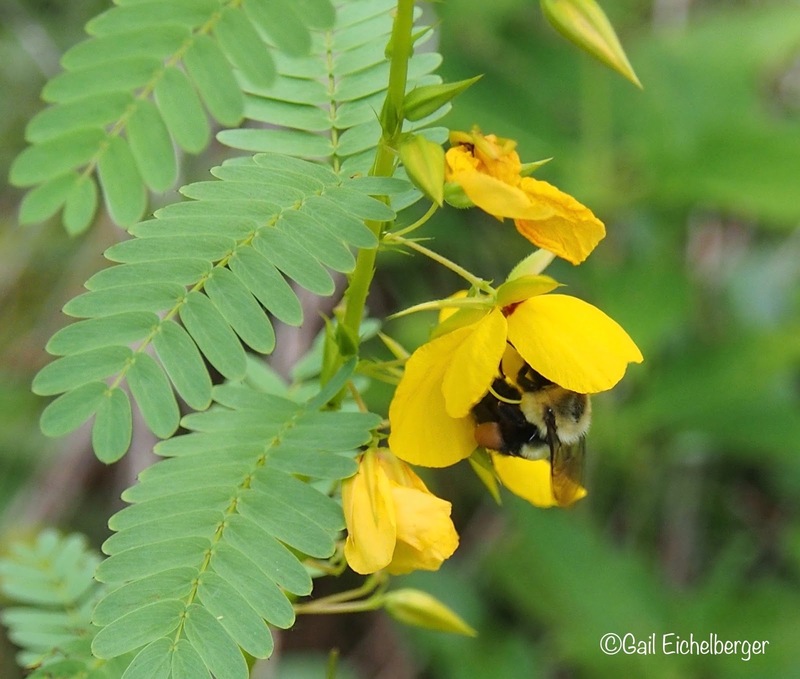 Chamaecrista fasciculata/Partridge pea, is an annual and a bumble bee magnet. Readily self-seeds in medium to dry soils, growing to 2’ in height. It's the host plant for Cloudless sulfur butterfly caterpillar. I expect to always have it in my garden. One plant in the Susan's bed is now 10! The leaves close up/fold up at dusk. Phlox 'Jeana' again...The Swallowtail butterfly love her. The plant that's budding next to 'Jeana' is Rudbeckia subtomentosa 'Henry Eilers'. Hemerocallis 'Autumn Minaret' introduced in 1951 by Stout. It continues to be popular because it blooms late; is extremely tall (up to 66 inches); and, is fragrant. I love all that, but, appreciate the simple flower shape. I hope it reblooms and that the deer don't discover it. African Blue Basil is a hybrid of two different basil plants that has inherited a camphor flavor from one of its parents. Although, edible, some say it makes a tasty pesto, I grow it because it's a bee magnet and flowers all summer. Happy Bloom Day my dears, now take the magic carpet ride to May Dreams Gardens where host extraordinaire Carol links to gardens all over this great big beautiful world. PS If you want to grow beautiful plants that attract pollinators to your garden you must never, ever, ever, ever, ever use pesticides. I really do mean never! 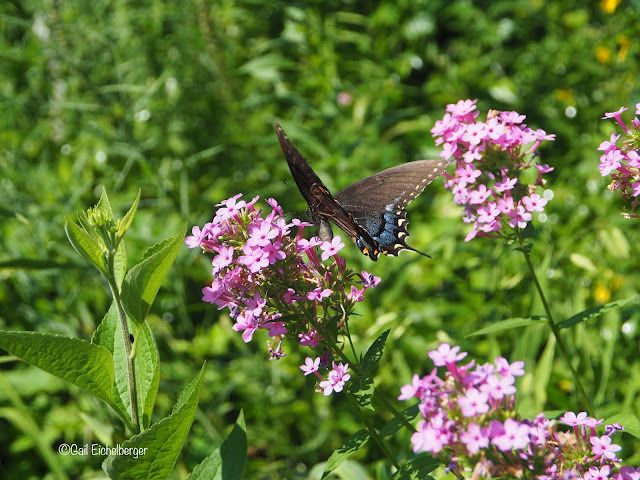 Beautiful flowers, and I love seeing all the bees and butterflies, too! Your blooms are beautiful and I love seeing all of the bumbles. Such sweet bees. 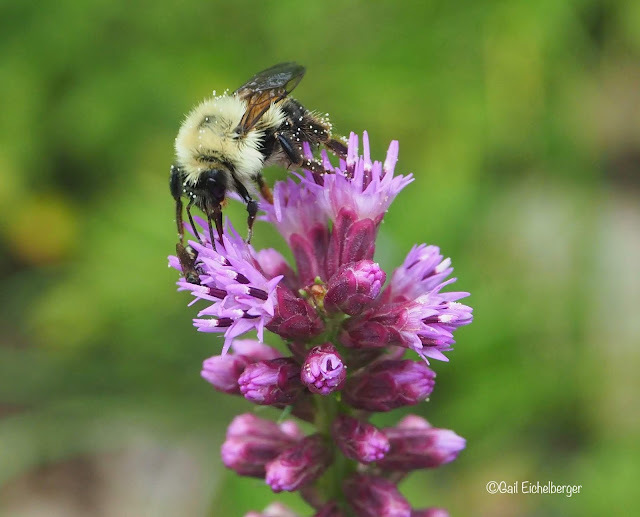 Such lovely blooms and wonderful pollinator photos! Gail - I've got bee balm and other pollinator plants like button bush, but there do not seem to be as many bees as last year. Your garden is spectacular - maybe all the bees are with you. 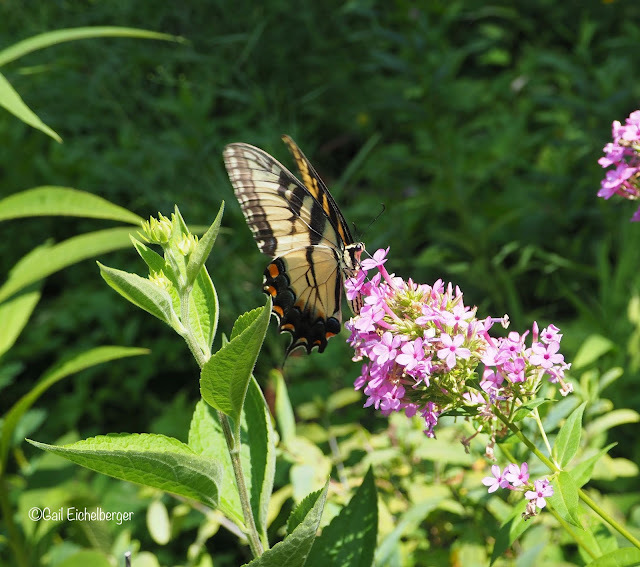 I am happy when butterflies are fluttering in, however in mine when they are already there i cannot anymore catch them in photos. I need to be out early in the wild to see them still drying their wings. 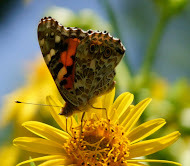 But i have lots of butterflies in my nectaring plants, and bees too. You should see my attempt in videoing bees on hoyas. Lovely blooms and great pictures. I love all the close ups with the pollinators! 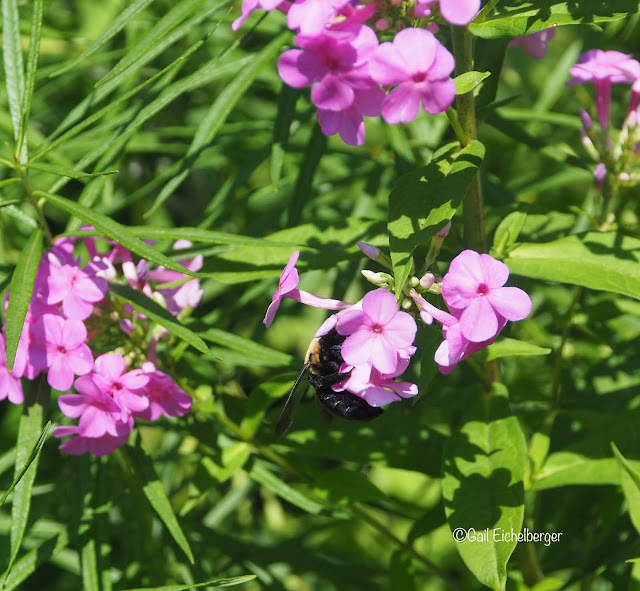 You can tell the pollinators are LOVING your garden right now! It's beautiful. Thanks for sharing. 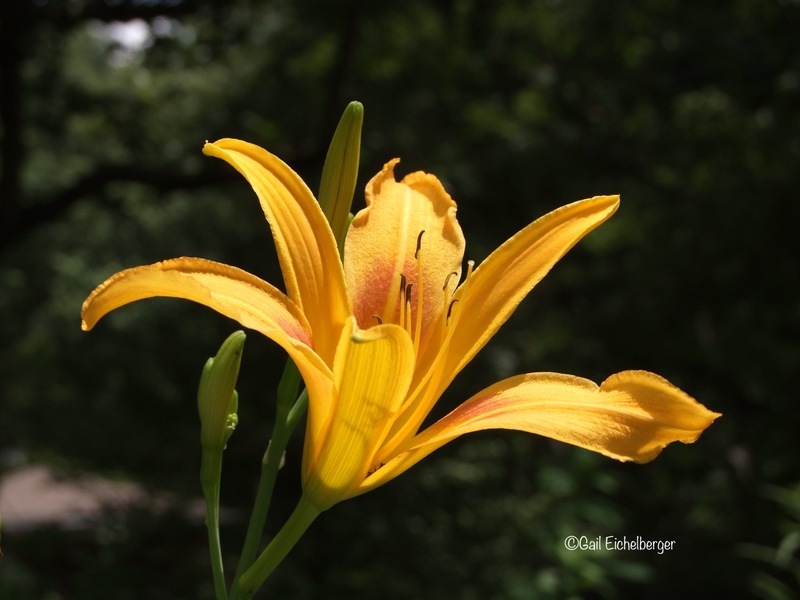 loved the shot of bumble bee and day lily bloom . PPS - Regarding cup plant, you say it's great for naturalizing. I've heard it can be, er, more than a little aggressive. What has been your experience? It spreads vegetatively and by seed. I pull dozens from the garden every month! But it can make a beautiful stand. So many beautiful blooms in your garden, Gail! The coneflowers are blooming here as well and I have some babies that I'm "babying" inside too - it's just been such a scorcher of a spring/summer this year that I won't be transplanting them until the fall - with some bunny protection. The rabbits don't seem to touch the older plants, but the babies that I transplant are apparently a delicacy! 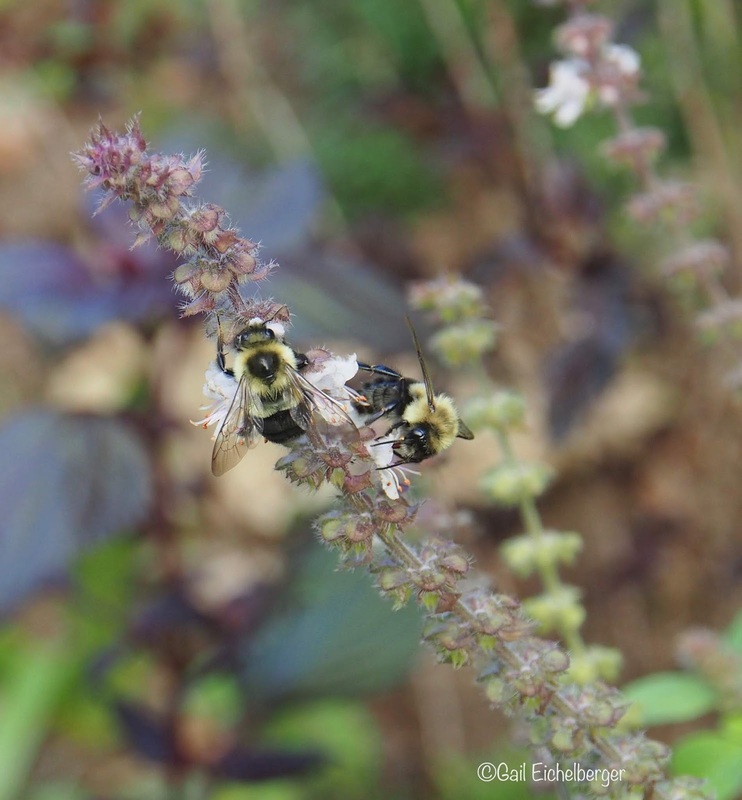 The pollinators seem very happy in your garden! I tried growing partridge pea from seed in my Parkway Bed but they couldn't compete with the established perennials. Oh, well.